Hi. 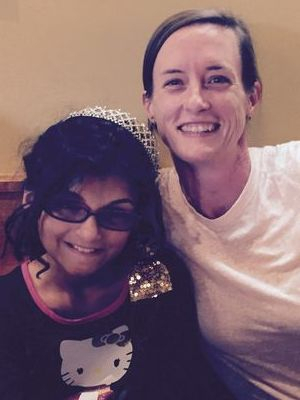 My name is Paloma Rambana, I'm 13-years-old and live in Tallahassee, Florida. I like to do all kinds of things that other kids do like swim, play with my sister and watch TV. And I am a HUGE fan of Hamilton and Queen! But, I was born with a rare condition called Peter's Anomaly, so I don't see very well. My doctors actually had to make new pupils in both of my eyes. I am visually impaired. 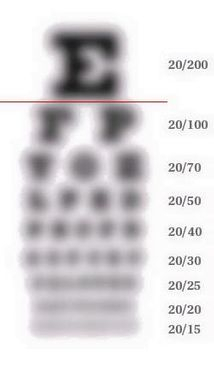 (To better understand low vision, see the graphic on the right.) Sometimes I get upset because I can't see as well as other kids, but then I think about how so many other kids can't see as well as I do and I want to help them. In Florida, and other states, not all kids who have serious vision problems get help. For some reason, babies through 5 years old get help and kids between 14 and 18 do, too. But kids like me between the ages of 6 and 13 who are blind or visually impaired don't get equipment or mobility training outside of school, regardless of our parents' financial need. I wish I knew why! I started a campaign called "Fund the Gap" to ask the Florida Legislature to fund the Division of Blind Services (DBS) Children's Program to help 340 kids in my age group (even though there are really 921 kids who need help.) On March 24, 2015 I took off from school and asked my legislators to support funding so all Florida kids can be good students and great adults! It was really fun and I even got to meet the Governor! (Check out my pics!) On April 16, 2015 and December 1, 2015 I led rallies from the Department of Education (which oversees DBS) to let other people know that kids my age really need this funding. My work has already started paying off! I’m thankful that so far Governor Scott signed off on $1,250,000.00 ($500,000 will recur every year!) and was named a 2018 Health Hero by Oprah Winfrey, one of America's Top Ten Youth Volunteers and A Kid Who Makes the World a Better Place by the New York Times* but there’s still so much work to do. My goal is to fund all 921 Florida kids who need help. At $8,800.00 per kid, that’s $8+ million! Will you help me help other kids?